To assess the impact of the Pet Shop Boys is to deconstruct a 25-year history of sparkling, sophisticated song-makingan intelligent pop evolution they inaugurated and continue to shape in subtle but salient ways. These days, it’s most fitting to view the Pet Shop Boys’ immortal echo through the lens of modern European-leaning pop, which continues to bear ‘dry lyrics and string pads,’ the band’s aesthetic hallmarks. With last year’s album Yestheir tenthNeil Tennant and bandmate Chris Lowe entrusted their iconic pop prowess in the hands of maverick production team Xenomania, to winning results. The Grammy-nominated album graced the UK Top 5 alongside Lady Gaga and Girls Aloud, the genre-defying pop group who serve as Xenomania’s muses and for whom Tennant wrote a hit single, ‘The Loving Kind.’ Taking modern-day pop stars under his wing has become a recurrent activity: last year, he invited Lady Gaga and Brandon Flowers to perform a string of hits at the BRITS. Call him everyone’s favorite pop uncle. 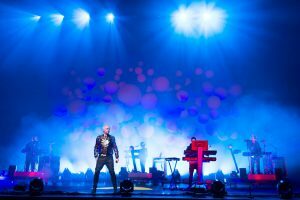 After the success of the year-long Pandemonium tour, which won awards for its inventive Es Driven-helmed set designs, Pet Shop Boys are set to headline the legendary Glastonbury stage tomorrow night for the second time in their career. We had the good fortune to speak with Neil Tennant as he reflected upon career triumphs both classic and current, the challenges of being a hit-maker at middle age, the surprising origins of ‘West End Girls’, and why people can’t let go of the 80s. NIKA: You were emulating ‘The Message’ by Grandmaster Flash, right? TENNANT: Not so much nowif anything, contemporary hip-hop and Top 40 pop culture is inspired by European dance music. A few years ago, P. Diddy showed up at Ibiza and discovered house music. Look at Kanye’s album. TENNANT: They’re fascinating because, like us, they work in the area of experimental mainstream pop music. Taking mainstream music by the scruff of its neck is the most exciting and difficult thing to do. They never stick to one sound, so they’re never boring. They have a big range. It’s a team of people who really love music, a situation which actually reminds me of my journalism days at Smash Hitswe were all obsessed with pop music. As musicians, Xenomania share that ethos and have a fresh outlook. So, working with them really suited us. We almost wrote with them for our previous record, Fundamental, but then we heard New Order were doing so, and we didn’t want to deal with accusations of ripping them off, even though that collaboration ended up fizzling. NIKA: What was the process of recording with Xenomania’s Brian Higgins like? He’s notoriously tricky to work withFranz Ferdinand actually quit working with the team because their energies clashed. TENNANT: I knowit’s a shame because I think that could have been an amazing record. For us, it was interesting because I find that Brian has a very flexible way of writing songs. But I think for a lot of bands, his methods are tricky, indeed. Brian is highly disciplined, and I think most acts find it very challenging to deal. NIKA: With those massive hooks, ‘Love Etc.’ should have been a #1 hit, no? TENNANT: It should have been bigger! But when you’re our age and you’ve been around a long time, it doesn’t matter how good the record is. They’re not going to play it! [UK’s] Radio 1 said to us, ‘It’s an amazing recordbut we’re not going to play it.’ It didn’t fit their youth demographic; they don’t want to introduce anyone new to the Pet Shop Boys. But in Germany, ‘Love Etc.’ was on the charts for months. Of course, we haven’t been played in America for years. TENNANT: Our drop off in American popularity happened very suddenly: it came down to one song in 1988, ‘Left To My Own Devices.’ EMI thought it was going to go to #1; it went to #84. And that was that. It was all over. Other people try to peg the nature of the ‘Domino Dancing’ video as the culprit, but I don’t really buy into that, though the homophobic thing was always an issue for us in America. Even the name of the band, Pet Shop Boys, seemed to rub people the wrong way. NIKA: Something of a ‘passing-the-torch’ moment occurred when you brought Lady Gaga and Brandon Flowers onstage with you at the BRIT Awards for your 25th anniversary last year. What led to those choices? TENNANT: That performance needed to be special. We needed a woman to sing Dusty Springfield’s lines in ‘What Have I Done To Deserve This?’ It was the year of Lady Gaga, so our manager said to us, ‘Ask her!’ I didn’t even know yet if she could sing it! But she did itand she was really, really great. She’s sharp. I like that she’s playing a character. And Brandon, we’ve known for awhile; he’s always been a fan. He’s meant to be a rock singer, and she’s a pop singer, and we brought them together unexpectedly. TENNANT: I sort of get a bit tired of people going on about how great the 80s were. At the same time, it was probably the last period of really creative and original pop songwriting. The 90s were steeped in nostalgia and everything became organizedthere ceased to be any underground. Everything became streamlined, less weird. 80s pop records are weird, 80s fashion is weird. You didn’t go out and buy an outfit, you created it. Look at Adam & The Ants. TENNANT: If you look through any music paper, it’s easy to encounter something new referred to as ‘Pet Shop Boys-esque.’ Usually, that indicates dry lyrics over a string pad and electronic beat. I don’t really care about thatI’m more interested in individual cases. Listen to some of Robbie Williams’s latest work or ‘Human’ by The Killers. You can hear us in there.